Before coming to Thailand I asked God to break my heart for what breaks His, and He has. He has continued doing so this past 6 months of DTS and also on outreach. Through this heartbreak I have learned how I constantly break the heart of God. I’m unworthy to be loved by Him and to be used by Him but He chooses me anyways. The stories I will share in the next 3 blog post are from experiences I have been honored to be a part of. Experiences I am so undeserving of so I hope I share in a way that brings glory to God. May my life live to glorify Him, to worship Him and to honor Him. Our outreach was split into 3 parts. Our first part of outreach was spent in Bangkok working with Baan Rak Teh (House of Authentic Love). This ministry is located in a slum area near the Grand Palace and Sanam Luang. This ministry works with the homeless in the area helping them get Thai ID cards. These cards are important because without them the Thai citizens cannot get the healthcare they need. A lot of the homeless have TB, HIV, and AIDS so being able to go to the hospital is important. Baan Rak Teh also works with the deaf community and have a few things for children. Not many children live in that area however so they mostly work with adults. There was one lady I had the opportunity to visit almost every day. I will call her P.W. She has HIV and painful boils all over her body. She stopped going to the Dr. because she doesn’t have an ID card and it was too much money to continue her routine visits. She is constantly scoffed at and passed by daily because people are afraid to touch her for fear of getting HIV or the skin condition. As I was talking to her some people sneered at us and asked why I was wasting my time with her. Some people even tried telling her what to do and to stop bothering the foreigner. I didn’t pay attention to them. I just kept listening to her story and how she got where she was today. Listening is so important these days! There are so many people in this world that just need someone to actually listen to them. When she gave me an opportunity I shared with her about Jesus love and that He has a better life in store for her than the life she is currently living. While I was praying for her I felt like God wanted me to give her a hug, so I did. When I asked if it was OK she couldn’t believe I would want to touch her. It was a really emotional time for both of us and even the translator told me she was surprised and touched by the moment. I wondered if this was what Jesus felt like when He talked to people. I wondered if this was how the lepers felt when they came to Jesus. I had so much compassion for her and I know it came from God. She prayed to receive Jesus and I connected her with Rak Teh who was able to help her get an ID card and proper medicine for her health issues. Unfortunately I had to leave after 2 weeks but the wonderful staff at Baan Rak Teh are continuing to disciple her and help her get back on her feet. I have great hopes for her future! We also had an opportunity to minister to the deaf community in Bangkok. Most of the people we met were born hearing but lost it because of high fever or having many ear infections that go untreated since they don’t have appropriate medical care. The school system in Thailand isn’t really set up to help them either and there are not many schools for deaf in Thailand. Because of this a lot of them don’t really learn becoming illiterate, which ends up putting them on the streets. Some of the deaf we met told us testimonies of how God met them in their dreams and they heard Him speaking to them!!! I thought that was really cool!!!! The power and miracles of God really do defy all laws of nature! What an incredible, mighty God I serve! I had the opportunity to preach at the deaf church. This was something I had never done before and I was really excited and nervous to speak to them about Jesus. I wasn’t really sure how to communicate effectively with them so I had one of my friends who works with deaf in America give me some tips and also one of the leaders at Rak Teh helped me figure out how to make my message work in a way that would be easy for them to comprehend. I spoke from John 15 about abiding in Christ. I got great feedback and the congregation responded well to the message, participating in the activities I had planned for them. It was so awesome to be used by God in a way I had never been used before. It reminded me that God doesn’t call the equipped but instead He equips the called. The leaders enjoyed the message so much that they invited me to speak at the service held at Rak Teh Monday nights. It was a blessing and honor to serve with these great people. One really special thing about this outreach was that the staff took time to encourage and disciple me and the other students of our DTS. They spoke life into us as well, even though they have so many others they are helping on top of their families. I really enjoyed my time hearing the staff’s stories and being encouraged by them as well. I learned a lot from them on this outreach. God also gave some of them visions for me that really excite me about my future in missions. I can’t wait to share more about this. 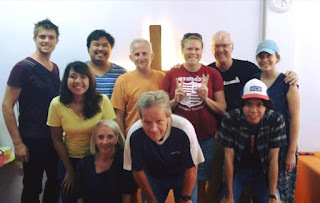 I also had the opportunity to speak with and learn from some key players in the YWAM Thailand Mercy Ministries; Steve Goode, and Sam and Pat Sarvis. These are great connections for when I return to Thailand next year. 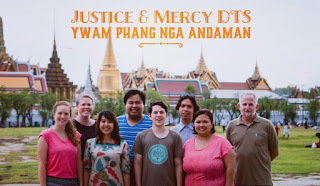 They have experienced a lot involving injustice over the past 30+ years and I enjoyed my time hearing their stories and getting to know more about the work of YWAM Thailand Mercy Ministries. They are very excited about the vision God has given me and look forward to helping me find direction in that vision! I thank God for them! Not only was this trip a good time of serving but healthy in being discipled as well by some great leaders in the fight against injustice. This was a great way to start off our outreach! !